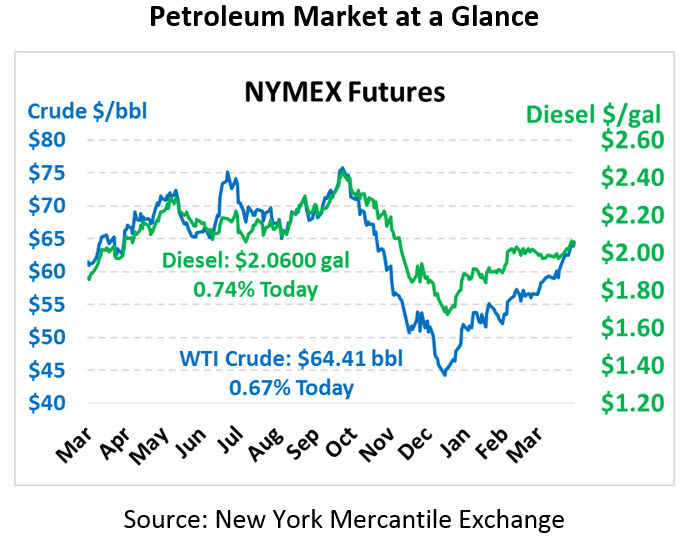 Oil is moving higher this morning amid a generally bullish API report and OPEC’s most recent monthly oil report. Crude oil is currently trading at $64.41, up 43 cents. Fuel prices are also on the rise, supported by steep product draws. Gasoline prices are currently $2.0338, up 3.5 cents to the highest level since October 2018. Diesel prices are $2.0600, up 1.5 cents. The API’s report noted a fairly large surplus for crude inventories, but markets looked past that number to the 1.3 MMbbl draw in Cushing, which is symbolically important as the delivery point for WTI crude oil. Product draws were substantial, leaving many postulating whether the EIA data will confirm the draw. OPEC released their monthly oil report, which indicated a half-million barrel per day decline in output for the group relative to last month. Overall, the group produced just 30 MMbpd in March. Cuts last month were both voluntary (Saudi Arabia and Iraq) and involuntary (Venezuela and Iran). Going against the grain, Russia is starting to hint they may drop out of the OPEC+ deal now that markets are closer to normal, citing domestic pressure to increase output. The EIA also released their Short-Term Energy Outlook, which highlighted continued acceleration in US production, including an increased estimate for 2019 production growth. In a reversal of recent norms, the agency actually slightly increased its demand forecast for 2020; many have been slashing expectations in anticipation of an economic slowdown. 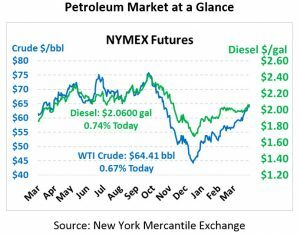 The agency’s Summer Fuels Outlook gave some insights into trends this summer, including higher gasoline demand than last year and America’s likely status as a net gasoline exporter for the first time since 1960. A pipeline near Nashville International Airport was damaged today, causing a large fuel leak. The damaged fuel line, operated by Colonial Pipeline, has been shut down and responders from Colonial were dispatched to the area. It’s currently unclear what type of fuel it is that leaked, but the line that was damaged is an automotive fuel line. This is a developing story and FuelNews will release updates as they become available.